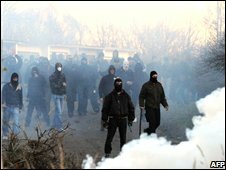 Riot police in the northern Czech town of Litvinov have waged a bloody battle with far-right protesters trying to reach a Roma (Gypsy) suburb. Police, some mounted on horses, tried to force back rioters from a 500-strong crowd with batons and tear gas as youths hurled petrol bombs and stones. Seven demonstrators and seven police officers were injured in the clashes. 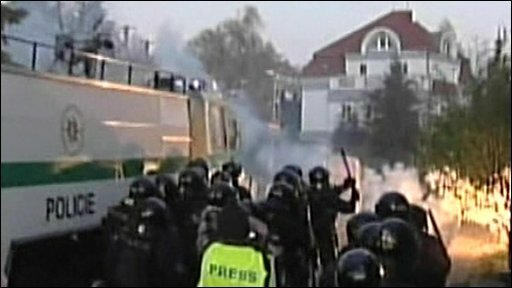 The violence broke out at a march by the far-right Workers' Party on Monday, a public holiday in the Czech Republic. At least one injured policeman could be seen lying on the ground with blood on his face, and a police car was set alight. About 1,000 police were deployed to control the marchers. "The police tried to get the demonstrators back to the planned march route but they started throwing flaming bottles," said police spokeswoman Jarmila Hrubesova. About 15 people were reportedly arrested. The Czech Republic's largely impoverished Roma population has repeatedly complained of endemic racial discrimination. However, radical right-wingers like the Workers' Party have failed to make inroads in national politics over the past decade, analysts say.